While this is based on a true story, inspired by a 2013 Wall Street Journal article entitled “It Takes Planning, Caution to Avoid Being It” by Russell Adams, and trumpeted on a “CBS Sunday Morning” show, Hollywood, in the persons of director Jeff Tomsic and writers Rob McKittrick and Mark Steilen have taken a heart-warming story of friendship and camaraderie that continued for years but added over-the-top segments that rob it of much, if not all, of its charm. It’s a low class movie that has women spouting F-bombs all over the place, like they were just “one of the guys.” I hate movies that have women with such filthy mouths when that has nothing to do with the plot. It’s just put in there by today’s secular filmmakers who want to take women off their pedestal as the mothers of our children and make them little different from men. Along those lines, one of the members of the real group is a Catholic priest. Tomsic and the writers torpedoed the idea of including a Catholic priest as an appealing figure in their group. 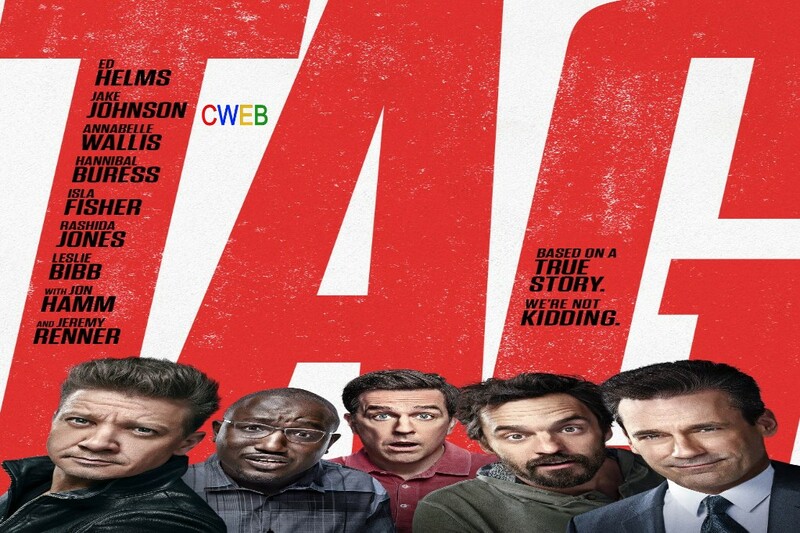 Despite a good cast, Ed Helms, Jon Hamm, Jeremy Renner, Isla Fisher, and others, Tomsic & Co. have drastically changed a sweet story about 10 high school buddies who continue to keep in touch 30 years after graduating by devoting one month a year playing the game of Tag that they spent their time in high school playing, by adding Hollywood touches that make the movie little more than teradiddle. While the principle is the same, they create the fiction that one of the buddies, Jerry Pierce (Remmer), has never been “tagged.” He is turned into a sort of superhero of Tag who can defy all odds and the engaging story is turned into an all-against-one battle that is violent (without any consequence) and inane. All the while Anna Malloy (Fisher), the wife of “Hoagie” Malloy (Helms), is mouthing one F-bomb after another, as does Rashida Jones, who plays Cheryl Deakins, the femme fatale former flame of a few of the guys. The ending adds an equally unnecessary maudlin twist. Although there were people in my screening laughing, I found nothing risible. This is a classic example of Hollywood ruining a good story by not having faith in the basic story itself.